Idols of Asia: Sufiah Yusof: genius on the game! Sufiah Yusof: genius on the game! From number cruncher to ball buster. That is the incredible story of Sufiah Yusof, a former math prodigy, who now earns her crust on the game!! Only three years ago it all looked good for Sufiah: not only had she been offered a place at the prestigious Oxford University to study mathematics, but the Malaysian government had also pledged her financial aid in consideration of the fact that her mother was a Malaysian from Johor. And so the shy and ungainly 13 year old was soon getting to grips with complex mathematical formulae. But that wasn’t the only thing she’d be getting her head around. Because teenage hormones can do incredible things. And so number crunching was no longer on her mind any more – but other things were. Her father, of course, was having none of it and the scene was set for her to run away from home. But maths don’t pay the rent, so she put 2 and 2 together to make six (sic) and not four. And at £130 (RM822) an hour she’s doing alright thank you very much! 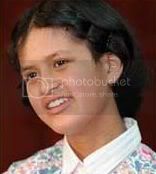 Update (6/6/2009): Sufiah Yusof is thinking of putting her incredible talent to good use in the classroom as a teacher. As to what she might teach is anyone’s guess – but I’ve a sneaky feeling it ain’t gonna be pure mathematics or statistics! Hahaha!